Ribosomes are the cellular structures responsible for protein synthesis. The word “synthesis” means “to combine things to produce something else.” In this context, protein synthesis means combining different amino acids together to form a protein. Ribosomes join amino acids together in a chain to form a protein (Figure 4.4a). This amino acid chain then folds into a complex 3-dimensional structure. 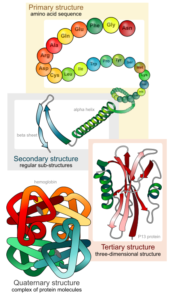 The shape of a protein is what gives the protein its specific function. When viewed through an electron microscope, free ribosomes appear as either clusters or single tiny dots floating freely in the cytoplasm. Ribosomes may be attached to either the cytoplasmic side of the plasma membrane or the cytoplasmic side of the endoplasmic reticulum. Electron microscopy has shown that ribosomes consist of large and small subunits. Ribosomes are enzyme complexes that are responsible for protein synthesis. Helpful Hint: Proteins are not typically used as a source of energy for the body. Protein from your diet is broken down into individual amino acids which are reassembled by your ribosomes into proteins that your cells need. Ribosomes do not produce energy.